Indian Country Bred is the common name for a inter-bred mixture of Bhutia Ponies, Spiti Ponies, and Tibetan Ponies. These animals have been interbred for years so that many of the individual characteristics of the Bhutia and Spiti have been lost, and they now are categorized as "Indian Country Bred." They originated in the Himalayan region of India, and are now found in the Buhtan, Sikkim, and Darjeeling regions of India. They were well suited to mountainous climate and terrain, they are not as able to endure humidity and heat. In fact, they are given to sun stroke and have trouble equalizing their internal temperature. A lack of nutritious grasses generally affects the growth and development of these ponies, although they have become incredibly tough and self-sufficient, requiring little fodder. Their conformation is usually not superior. They have a large head and pronounced jaw, short neck, low withers, sloping quarters, and deep chest. Their shoulder is a bit straight and upright, the legs, although short, are very strong. 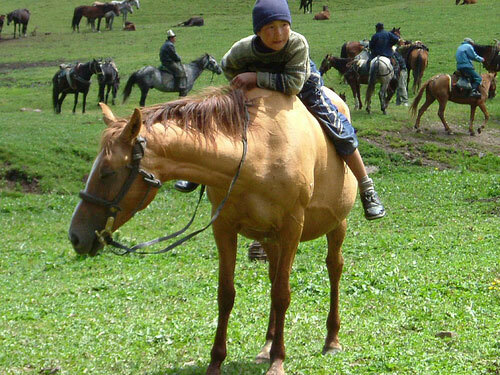 Bhutia-type ponies range in height from 12-13.2 hh, and are usually gray in color, although a few are chestnut or roan. Spiti-type ponies usually never get taller than 12 hh, and they are usually gray or dun in color, although they may be any solid color. Indian Country Bred ponies are kept for work, as pack animals and sometimes for riding. They have great endurance and stamina. They generally have a willing and quiet temperament.